Taking the Grill to New Heights! The brand newly opened Charcoal by The Saujana Hotel Kuala Lumpur is unlike any grill that I have come across. Charcoal is a unique new open grill restaurant that takes grilled and BBQ cuisine to new heights. Its concept is inspired by the age of old technique of cooking over charcoal coupled with the local tradition of using local infused condiments, dips and sauces to create a fusion of chargrilled meats and seafood with an added dimension of flavour and depth. The modern contemporary take on Charcoal menu is very drool worthy and is brilliant alchemy to the gastronomy cuisine. When I first heard of Charcoal through social media and also through the radio broadcast, I can’t help but to drool over the statement of Grilled Meat with Tamarind and Gula Melaka sauce and its list of delectable dishes. The names of the dishes are enough to tempt many foodies to make way for a taste at Charcoal. 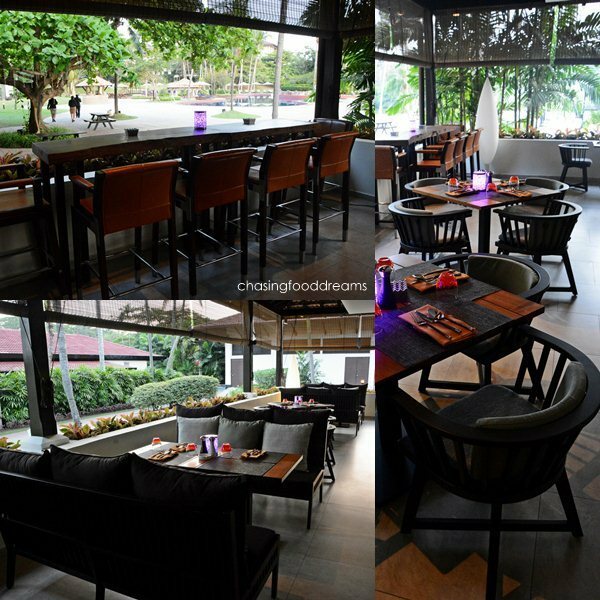 Arriving at Charcoal, I was pleasantly surprised by the modern contemporary ambience of the restaurant. Taking spotlight was, of course, the open grill kitchen right. How can one not be in awe of the gorgeously designed open kitchen set with a mega ‘Rolls Royce’ charcoal grill? The open 360 degree grill has many functions and sections, each allow the various meat and seafood to be grilled to perfection according to the heat levels that is control by adjusting the height of the grill. There is a whole spit roast available on the grill where a very delectable Whole Lamb Panggang is being rotate slowly over hot coals. As the juices and oils drips off the lamb onto the hot coals, sizzling sounds coupled with luscious smoky aroma of spices enhances the gourmet dining experience at Charcoal. Sticks of satay skewers are also seen on the grill, getting ready to be savored by diners. The grill even has its own sink and place for boards. An ultra large industrial hood hovers over the grill, ensuring that all the smoke is kept within the open kitchen. Moving on to the dining area, dining is sectioned off and most tables are set in big groups. There is regular seating and banquette seating, dine-in air conditioned or al fresco seating. There is also a huge private hall perfect for events and 5 smaller private rooms for personal dining. Charcoal has wall-to ceiling glass panels that overlook the hotel’s lush green landscape and skylights that fill the interior with lots of natural sunlight. The warm wood colors create soothing earth tones with the cool gray walls and rich leather furniture. Charcoal also boasts of an elegant wine cellar filled with a list of international wines to be paired with the grilled meats and seafood. Chef Robert Johnston helms the grill together with Auntie Belle who is the mastermind behind all the luscious sambals, dips and sauces. Chef Robert hails from Newcastle, Australia and brings with him a list of exclusive experiences from his many stints in working from several Michelin starred restaurants all over the world. Auntie Belle is a familiar face as she was previously manning the Nyonya restaurant at the hotel before it was revamped to Charcoal. The duo work their charm on a menu filled with a list of premium quality meats and seafood imported from all over the world tweaked with a touch of local flavours. With a name like Charcaol, it only makes sense that Charcoal Water was presented at the restaurant. Served in an elegant tall decanter, water is infused with charcoal as a water purifying agent. This works beautifully with all the grilled dishes served at the restaurant. At Charcoal, freshly baked breads are simply a must, served with salted butter. The real McCoy butter served with mini Charcoal Buns with Cherry Tomatoes and Mini Baguette is so good that one may need to instill some self-control to save some room for dishes later. That evening, we took on the most basic and all-time favorite Chicken, Lamb and Beef Satay. At Charcoal, the sticks of Satay were thick, juicy and well marinated. It is even served on miniature charcoal burner to keep it warm when we savor it. It makes a nice presentation though the satay skewers never lasted long on the tiny grill as they were utterly divine with caramelized edges. All three meats are tender with a melodious balance of sweet and savory. I can taste the aromatic lemongrass in the satay. These are served with the usual suspects of ketupat, cucumber, onions and satay sauce. Another local favorite served in Charcoal was the Ayam Percik with Fragrant Rice. Looking deceptively simple, the boneless thigh smothered in a creamy spicy peanut and coconut gravy has a hidden surprise element. The chicken opens up to reveal a stuffing of soft spinach leaves. It is a well-thought single meal with the rice, meat and vegetables. The chook is lusciously succulent as it had juices literally flowing out as we cut into it. Though the chicken is tender and juicy, it’s rather delicate on flavours but that is easily remedied by the delish peanut and coconut percik sauce. Squeeze a bit of lime on this and the flavours perked up even more. I also like how there are crisp caramelized edges on the chicken skin… yum! South Australian 100% Black Angus Tenderloin already sounds perfect and when its simply grilled naked and served sea salt with a side of Sarawakian Black Pepper sauce and vegetables, it’s a thoroughly a steak worth lusting after for. Though I am always a ribeye cut kind of foodie since I enjoy a little fatty goodness, I must say that this tenderloin is pretty darn good. Lean and tender, my knife glides through this like a smooth operator. Beautifully medium pink, one can also see how juicy the meat is as it has been well-rested. The charred edges gave this beef its character and the light smokiness is delightful. My advice is to savor this meat with the various sambals and chutneys from Auntie Belle for extra local flavours. If you see these four bottles of sauces, hold on to them during this meal… these are so good, especially the Sambal Mangga, a mango infused chili sauce that is fruity, sweet and spicy. I swear it goes well with everything from meat to seafood. There are also the Nyonya Kerabu Sauce, Sambal Hijau and Chili Garlic. The Kerabu sauce has a vibrant herb and spice notes like ginger bud, kaffir lime, chilies and more while the Sambal Hijau shows off lots of herb notes with chili. The Chili Garlic is perfect for poultry as it reminds me of the Chicken Rice chili, spicy, garlicky and tangy. It might come with a hefty price tag but the colossal Tiger Prawns with Kaffir Lime Leaves and Lemongrass Marinade is thoroughly fresh, juicy and sweet. The soft nuances of lemongrass and aromatic kaffir lime leaves did justice to the crustaceans. One can add more sea salt to adjust according to their taste. The Wild Sarawak Garoupa in Tumeric and Sea Salt Rub came as a whole fish, allowing diners to enjoy the full spectrum of the sweet creamy fish flesh, bone and all. A side of tangy tamarind and gula Melaka sauce with bird eye chili and onions pump up the flavours, making it beautifully local and delicious. Of course there are other fishes available so ask the wait staff for your preference. Besides the grilled meat and seafood, Charcoal also serves up Auntie Belle’s Peranakan flavour-infused dishes. We had the Terung Sumbat Bakar (Baked Stuffed Eggplant) and Barkke Kari Ambila Kacang (Spicy Tamarind Braised Beef with Long Beans) that evening. I adored the Terung Sumbat Bakar! Soft sweet round eggplants are stuffed with a fish mousse paste, similar to otak otak, before being baked and served with a creamy yellow sauce. The fish mousse is pretty light and delicate in texture but has enough flavours to round up the whole dish. The Barkke Kari Ambila Kacang is a favorite of many and is also Auntie Belle’s specialty. It is beef chunks braised in hot and spicy curry gravy with lots of crunchy green beans. The spices are very well balanced, rendering heat and spice notes with a pungent taste. It is a bowl of sour, spicy and robust curry. The dish practically begs for a bowl of white rice, for which I am sure I would have polished off the whole bowl happily if I wasn’t already so full. After savoring all the grilled meats and seafood together with the strong notes of Peranakan dishes, we needed on a very local note that is lightly fusioned up. Bingka Ubi Kaya (Tapioca with Glutinous Rice and Grilled Mango) and Grilled Exotic Fruits with Spiced Kalamansi, Caramel Sauce and Pineapple Sorbet are very enjoyable and easy on the tummy. These are light and fruity and provided a sweet and delicate ending to a very enjoyable dining experience at Charcoal. 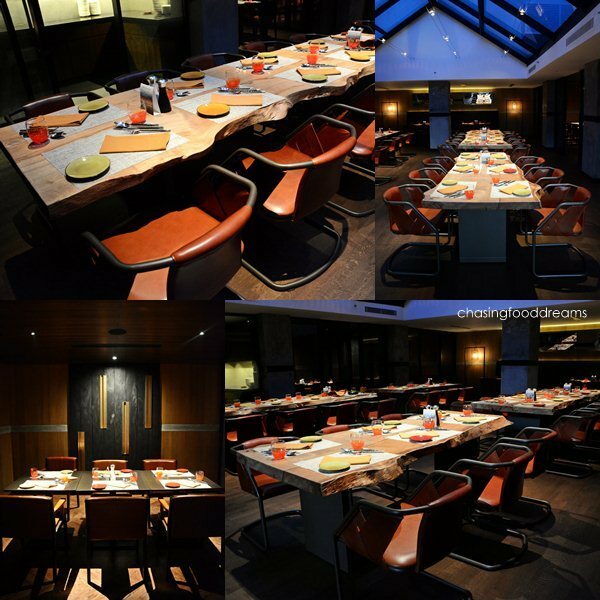 A New Malaysian Style Grill Room experience that you don’t want to miss! For RM99++ per adult and RM49.40++ per child, enjoy a sumptuous feast of grilled meats and seafood, Peranakan and International dishes, desserts and more available every Friday, Saturday and Sunday at Charcoal. Ala carte is also available. Lifestyle by Saujana loyalty card menmbers enjoy up to 50% discount when dining at Charcoal while CIMB cardholders are entitled to 15% to 20% off their food bill. Oooo this looks like the kinda place my Hubby would love. Meat galore! Every hotel has its own way of making food specially in Kuala Lumpur when i was at tour i also taste different kind of food and i hope new tourist also manage it and at that time i am in US and use GBT services for travel buses from nyc to orlando florida..